Practice Analog Circuits questions and answers for interviews, campus placements, online tests, aptitude tests, quizzes and competitive exams. This set of Analog Circuits Questions and Answers for Experienced people focuses on “Constant Voltage Drop Model-2”. Explanation: In constant voltage drop model at forward bias diode can be replaced as a cell and in reverse bias diode can be avoided by considering the terminals are open. In above circuit both the diodes are reverse biased and can be considered as open circuit. Hence output voltage is 0V. 2. Current I if voltage V = 5V, VB = 2V, R1 & R2 = 2K. Explanation: In constant voltage drop model at forward bias diode can be replaced as a cell and in reverse bias diode can be avoided by considering the terminals are open. Since Vin and VB are opposite net voltage is 3V. Voltage at R1 is 3V so current is 1.5mA. Voltage at R2 is 3-0.5 = 2.5V. So the current is 1.25mA. The net current is 2.75mA. When V=5V, diode is in forward bias and net total voltage becomes 4.5V across R1. Current through branch 1 will be 4.5V / 2K = 2.25mA. Current through branch 2 will be (4.5-2)/4K = 0.625mA. So net current is sum of these two. Therefore, net current is 2.875mA. When V= -5V, the diode is reverse biased and net current flowing is zero. Since Vin is reverse bias to the diode all voltage will appear across diode and no current flows. Thus, voltage across diode is Vin-VB = 1V. Net voltage V=3V. Explanation: The diode is in reverse bias and voltage across diode is -3V. Hence the voltage across the resistor is Vin+VD-VB=5-3-2=0V. Explanation: In constant voltage drop model at forward bias diode can be replaced as a cell and in reverse bias diode can be avoided by considering the terminals are open. 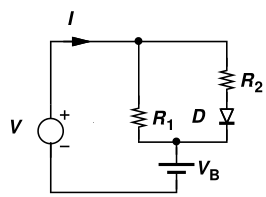 The diode here is in reverse bias and may be considered as an open circuit. Hence, the voltage across the diode is 4-3=1V. Explanation: In constant voltage drop model at forward bias diode can be replaced as a cell and in reverse bias diode can be avoided by considering the terminals are open. Since diode is forward biased it will produce a voltage drop of VD. Since current source forward bases the diode voltage drop across diode is VD. So net voltage output is VD+VB. 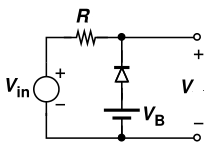 Since current source reverse biases diode, all current pass through resistor R. So voltage across resistor is 4V. Since voltage source cannot produce current due to lack of closed circuit total voltage at the output is 6V. 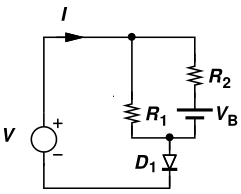 Since diode is forward biased and parallel to resistor R1 voltage drop across diode is VD. So net voltage equals to Vin –VD. Sanfoundry Global Education & Learning Series – Analog Circuits. 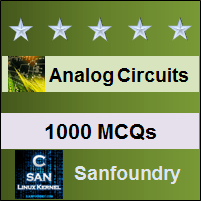 To practice all areas of Analog Circuits for Experienced people, here is complete set of 1000+ Multiple Choice Questions and Answers.